Abstract: Event Data Recorders (EDR's) have been installed in many motor vehicles since the 1990's. With the advent of sophisticated occupant restraint systems, including belt pretensioners and smart airbags, EDR's have recorded an increasing number of crash-related parameters. Similarly, advanced collision avoidance systems have become prevalent in the vehicle fleet and EDR's are now used to capture a wide range of pre-crash data elements relating to this technology and the resulting status of the vehicle and its control systems. Such data provide a wealth of information related to driver actions, and on the functionality and effectiveness of vehicle safety systems. The current paper will provide an overview of the scope of data elements captured by modern EDR's and will demonstrate the utility of these data through case studies of real-world events. Abstract: In 2011 NHTSA made changes to the NCAP frontal full-width test rating that introduced a chest deflection metric. The dummy seating protocol did not specify routing procedures that consistently control shoulder belt positioning on the dummy. Thus, most NCAP tests were conducted with the D- ring in the fully up position, placing the shoulder belt far above the center chest potentiometer. 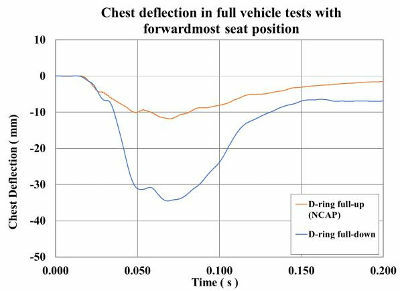 Sled and full-vehicle crash tests of a 2011 Dodge Caliber demonstrated that for the 5 th percentile small female passenger dummy, the high D-ring position causes the belt to cross the chest above the location of the deflection potentiometer. The ribeye gauges show that this belt configuration produces deflection measurements that are higher than those measured by the center potentiometer. The differences in chest deflection measurement caused by variations in belt routing are not trivial. For the Caliber, the NHTSA NCAP test produced a chest deflection of 11.8 mm, corresponding to a risk of serious chest injury for older females of 0.6%. 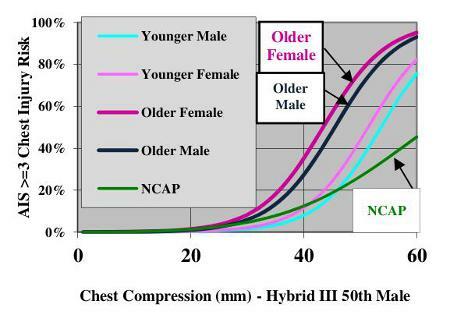 A crash test conducted by IIHS under the same conditions but with the belt routed across the deflection potentiometer produced a chest deflection of 34.5 mm, corresponding to a risk of serious chest injury for older females of 44.7%. Abstract: Injury Risk Curves are developed from cadaver data for sternal deflections produced by anterior, distributed chest loads for a 25, 45, 55, 65 and 75 year-old Small Female, Mid-Size Male and Large Male based on the variations of bone strengths with age. 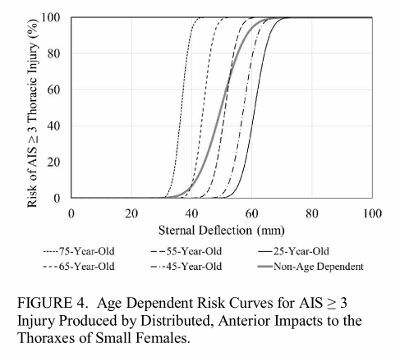 These curves show that the risk of AIS = 3 thoracic injury increases with the age of the person. This observation is consistent with NASS data of frontal accidents which shows that older unbelted drivers have a higher risk of AIS = 3 chest injury than younger drivers. Abstract: Light duty vehicles in the US are designed to meet and exceed regulatory standards, self-imposed industry agreements and safety rating tests conducted by NHTSA and IIHS. The evolution of side impact regulation in the US from 1973 to 2015 is discussed in the paper along with two key industry agreements in 2003 affecting design of restraint systems and structures for side impact protection. A combination of all the above influences shows that vehicles in the US are being designed to more demanding and comprehensive requirements than in any other region of the world. The crash environment in the US related to side impacts was defined based on data in the nationally representative crash database NASS. Crash environment factors, including the distribution of cars, light trucks and vans (LTV's), and medium-to-heavy vehicles (MHV's) in the fleet, and the frequency of their interactions with one another in side impacts, were considered. Other factors like, crash severity in terms of closing velocity between two vehicles involved in crash, gender and age of involved drivers in two-vehicle and single vehicle crashes, were also examined. Injury risks in side impacts to drivers and passengers were determined in various circumstances such as near-side, far-side, and single vehicle crashes as a function of crash severity, in terms of estimated closing speed or lateral delta-V. Also injury risks in different pairs of striking and struck cars and LTV's, were estimated. A logistic regression model for studying injury risks in two vehicle crashes was developed. The risk factors included in the model include case and striking vehicles, consisting of cars, SUV's, vans, and pickup trucks, delta-V, damage extent, occupant proximity to the impact side, age and gender of the occupant, and belt use. Results show that car occupants make up the vast majority of serious-to-fatally injured occupants. Injury rates of car occupants in two-vehicle collision are highest when the car is struck by a pickup and lowest when struck by a car. This was the case across all lateral delta-V ranges. Additionally, near-side injury rates are substantially higher than those in far-side impacts. Abstract The Insurance Institute for Highway Safety has recently introduced a small overlap frontal crash test in its frontal rating scheme. Another small overlap frontal crash test is under development by the National Highway Traffic Safety Administration (NHTSA). Whereas the IIHS test is conducted against a fixed rigid barrier, the NHTSA test is conducted with a moving deformable barrier that overlaps 35% of the vehicle being tested and the angle between the longitudinal axis of the barrier and the longitudinal axis of the test vehicle is 15 degrees. The field relevance of the IIHS test and the NHTSA test has been the subject of previous papers by Prasad et al. The current study is aimed at examining the combined relevance of the two tests as representing frontal corner impacts involving small overlap. The field relevance is indicated by the frequency of occurrence of real world crashes that are simulated by the test conditions, the proportion of serious-to-fatal real world injuries explained by the test conditions, and rates of serious injury to the head, chest and other body regions in the real world crashes resembling the test condition. The database examined for real world crashes is NASS-CDS. The frontal corner impacts as represented by the 25% Small overlap frontal and the NHTSA tests together address slightly less than 9% of all frontal crashes and 6% to 12% of all MAIS3+F injuries to the drivers in these crashes. The IIHS test has a somewhat higher contribution in both the incidence and severity. The two crash modes together address 4.6% to 8.2% of all MAIS3+F head injuries. Similarly, the proportion of all frontal MAIS3+F chest injuries addressed by the two crash modes or corner tests is estimated to be 6% to 10.6%. The available data for the passenger involved in driver-side frontal corner crashes indicate that elderly female occupants predominantly experience serious head and chest injuries. All, except one, injured passengers were females. The average age of injured females who had chest injuries was slightly over 65 years. Injury rates of the head and the chest are substantially lowered in far-side than in near-side frontal impacts. Crash test ATD rotational responses of the head in the tests substantially over predict the real world risk of serious-to-fatal brain injuries. Abstract In recent years, due to initiatives such as Road Safety Vision 2010, and the National Occupant Restraint Program, Canada has seen reductions in casualties resulting from motor vehicle collisions. Indeed, the most recent collision statistics, published in 2012, show the lowest death toll on the nation's roads in almost sixty years. Furthermore, the most recent seat belt surveys, conducted in 2009-10, indicate that Canadians are buckling up in motor vehicles more than ever, with an overall usage rate in excess of 95%. Despite these very encouraging signs, the percentage of motor vehicle occupants who are fatally injured while not using seat belts remains unacceptably high at more than 35%. This problem is particularly well exemplified by fatalities resulting from single-vehicle rollover crashes. Such collisions frequently occur as a result of loss of directional control on the part of the driver, and involve vehicle yaw and a lateral rollover, a crash mode that is often benign. Belted occupants are generally retained inside the vehicle and come to little harm. However, such may well not be the case for the unbelted who are in considerable danger of being ejected from the vehicle, with the consequent potential for serious or fatal injury. The present study looks at this latter issue, both from the perspective of the national collision picture, and from a series of in-depth investigations of fatal crashes. Abstract: A small overlap frontal crash test has been recently introduced by the Insurance Institute for Highway Safety in its frontal rating scheme. Another small overlap frontal crash test is under development by the National Highway Traffic Safety Administration (NHTSA). Whereas the IIHS test is conducted against a fixed rigid barrier, the NHTSA test is conducted with a moving deformable barrier that overlaps 35% of the vehicle being tested and the angle between the longitudinal axis of the barrier and the longitudinal axis of the test vehicle is 15 degrees. The field relevance of the IIHS test has been the subject of a paper by Prasad et al. (2014). The current study is aimed at examining the field relevance of the NHTSA test. The field relevance is indicated by the frequency of occurrence of real world crashes that are simulated by the test conditions, the proportion of serious-to-fatal real world injuries explained by the test condition, and rates of serious injury to the head, chest and other body regions in the real world crashes resembling the test condition. The database examined for real world crashes is NASS. Results of the study indicate that 1.4% of all frontal 11-to-1 o'clock crashes are simulated by the test conditions that account for 2.4% to 4.5% of all frontal serious-to-fatal (MAIS3+F) injuries. Injury rates of the head and the chest are substantially lower in far-side than in near-side frontal impacts. Crash test ATD rotational responses of the head in the tests over-predict the real world risk of serious-to-fatal brain injuries. Abstract: In North America, frontal crash tests in both the regulatory environment and consumer-based safety rating schemes have historically been based on full-width and moderate-overlap (40%) vehicle to barrier impacts. The combination of improved seat-belt technologies, notably belt tensioning and load limiting systems, together with advanced airbags, has proven very effective in providing occupant protection in these crash modes. Recently, however, concern has been raised over the contribution of narrower frontal impacts, involving primarily the vehicle corners, to the incidence of fatality and serious injury as a result of the potential for increased occupant compartment intrusion and performance limitations of current restraint systems. 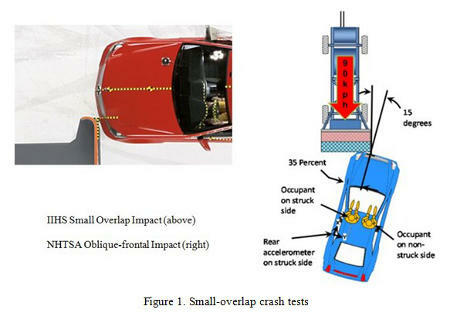 Drawing on data documented in the National Automotive Sampling System (NASS)/ Crashworthiness Data System (CDS) for calendar years 1999 to 2012, the present study examines the characteristics of existing and proposed corner crash test configurations, and the nature of real-world collisions that approximate the test environments. In this analysis, particular emphasis is placed on crash pulse information extracted from vehicle-based event data recorders (EDR's). Abstract: This paper presents the analysis of a series of frontal crash tests conducted by the Insurance Institute of Highway Safety that are commonly referred to as Small Overlap Impacts (SOI). The occurrence and severity of such frontal impacts in the real world were estimated using two different methods. Both methods used the National Automotive Sampling Scheme (NASS), which is a stratified sample of crashes in the US. 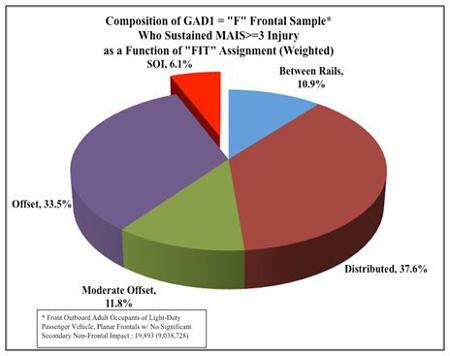 The first method utilized an algorithm commonly known as Frontal Impact Taxonomy (FIT). The second method was based on comparison of deformation patterns of vehicles involved in frontal crashes in the NASS data files with those produced in tests conducted by the IIHS. FIT analysis of the data indicate that approximately 7.5% of all 11-1 o'clock frontal crashes in NASS are represented by the IIHS SOI test condition and they account for 6.1% of all serious-to-fatal injuries to front seat occupants restrained by seat belts and airbags. Based on the analysis of test and crash front end damage data, it is estimated that the IIHS SOI test mode represents 3% to 8% of all fatal crashes and 4.6 to 9% of all MAIS3+F injury producing frontal crashes. Abstract: Minimizing the injury potential of the interactions between deploying airbags and car occupants is the major issue with the design of airbag systems. This concern was identified in 1964 by Carl Clark when he presented the results of human volunteer and dummy testing of the "Airstop" system that was being developed for aircraft. The following is a chronological summary of the actions taken by the car manufacturers, airbag suppliers, SAE and ISO task groups, Research Institutes and Universities, and consumer and government groups to address this issue. Abstract: The objective of the paper was to apply to the NCAP star rating system injury risk functions that are more representative of the injury tolerance of older occupants. The NASS 1998-2008 data for front outboard occupants in NCAP like frontal crashes protected by air bags and safety belts was analyzed to determine injury risks by body region and occupant age groupings. The injury rates for NCAP like crashes were calculated for each applicable body region. Alternative injury risk functions were applied to 302 NCAP tests of vehicles model year 1988-2006. NCAP injury rates were calculated and compared with NASS data. The comparison was used to select injury risk functions to be applied to 2011 NCAP tests. Selected risk functions from the literature that produced injury rates in NCAP tests like those in NCAP like crashes were substituted for NCAP 2011 chest and neck injury risk functions. When applied to the 2011 NCAP tests there was a general downward shift in the star ratings awarded to the driver. However, the number of passengers with 5 star ratings more than doubled. For both drivers and passengers there were vehicles that advanced from 4 stars to 5 stars. The application of this alternative rating system would produce added incentives for safety designs that more correctly prioritize the reduction of injuries most harmful to older occupants. Abstract: Over the next two decades, the representation of elderly occupants in motor vehicle crashes in Canada can be expected to increase dramatically. The number of Canadians 65 years of age or older is expected to double, increasing from some 5 million to close to 10 million. By 2031, individuals 65 years of age or older will account for close to 27% of adult Canadians. Increasingly, the protection requirements of the elderly will need to be considered if future efforts to reduce the total number of Canadians seriously injured or killed annually in traffic collisions are to be successful. Abstract: In recent years, major advances in field data collection and analysis have been achieved through the integration of real-world vehicle crash data captured by on-board, electronic, event data recorders (EDR's). For some time, data has been publicly available from EDR's in General Motors, Ford, and Chrysler vehicles. Recently, Toyota has provided a proprietary tool through which researchers can access EDR's installed in their vehicles. The current study looks at the crash data that are available and explores the accuracy of this information. The study uses a series of staged collisions with EDR-equipped vehicles and compares data downloaded from these devices to equivalent information captured by laboratory instrumentation. 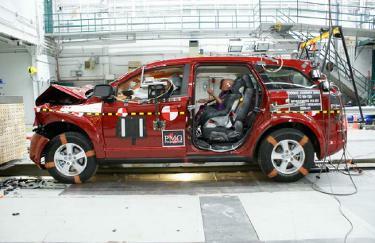 Full-frontal crash tests, conducted by Transport Canada, at 48 km/h into a rigid barrier are used. The results show generally good agreement between the two datasets, with some limitations in the EDR-reported data being noted. These comparisons of data obtained from on-board vehicle EDR's, with equivalent information collected using sophisticated laboratory instrumentation, provide a valuable measure of confidence in the use of similar data collected from real-world events. Abstract: In recent years, major advances in field data collection and analysis have been achieved through the integration of real-world vehicle crash data captured by on-board, electronic, event data recorders (EDR's). To date, publicly-available data have been limited to just two manufacturers, namely General Motors and Ford. Recently, Chrysler has provided a tool by which researchers can access EDR's installed in their vehicles. The current study looks at the new crash data that are now available from Chrysler vehicles and explores the accuracy of this information. The study uses data from a series of staged collisions with EDR-equipped vehicles and compares data downloaded from these devices to equivalent information captured by laboratory instrumentation. Full-frontal crash tests, over a range of test speeds, and conducted on a number of different model vehicles, are used in the study. Résumé : Au cours des dernières années, d'importants progrès dans le domaine de la collecte et de l'analyse de données ont été faits grâce à l'intégration de données sur les accidents impliquant des véhicules réels qui ont été recueillies par des enregistreurs de données routières (EDR) électroniques et intégrés dans les véhicules. À ce jour, les données accessibles au public ont été limitées à deux fabricants : General Motors et Ford. Récemment, Chrysler a fourni un outil par lequel les chercheurs peuvent avoir accès aux EDR intégrés dans leurs véhicules. L'étude actuelle examine les nouvelles données sur les collisions qui sont maintenant disponibles à partir des véhicules Chrysler et explore l'exactitude de cette information. L'étude utilise des données tirées d'une série d'essais de collisions menés avec des véhicules équipés d'EDR et compare les données provenant des EDR à des données équivalentes provenant d'appareils de laboratoires. L'étude a mené des essais de collision frontale sur une gamme de vitesses d'essais et à l'aide d'un certain nombre de modèles différents de véhicules. Abstract: Increasingly, vehicle manufacturers are developing tools which allow access to data stored on on-board event data recorders (EDR). The information stored by such devices have the potential for providing levels of insight into crashes well beyond that achievable with conventional collision reconstruction techniques. 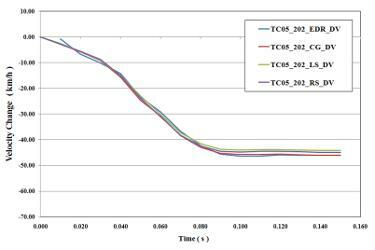 The current work identifies the nature of the stored data that can be retrieved from the on-board event data recorders in Toyota vehicles, and evaluates the accuracy of the crash pulse data based on information obtained from frontal crash tests. 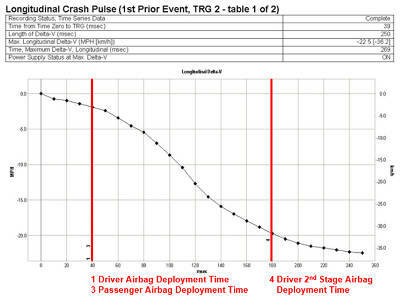 An overview of the pre-crash and crash-pulse data provided by Toyota EDR's is presented. The accuracy of the crash-pulse data is explored from a series of staged collisions with EDR-equipped vehicles. Data downloaded from the EDR's are compared to equivalent information captured by laboratory instrumentation. Full-frontal crash tests, over a range of test speeds, and conducted on a number of different model vehicles, are used in the study. Résumé : De plus en plus, les constructeurs de véhicules conçoivent des outils qui donnent accès à des données stockées sur des enregistreurs de données routières (EDR) se trouvant à bord. Les données stockées sur ces dispositifs peuvent offrir des niveaux de précision sur les collisions de loin supérieurs à ceux que permettent d'atteindre les techniques conventionnelles de reconstitution des collisions. Les travaux actuels permettent de déterminer la nature des données stockées qui peuvent être retrouvées à partir des enregistreurs de données routières se trouvant à bord de véhicules de marque Toyota, et d'évaluer l'exactitude des données selon les renseignements obtenus à partir de tests de collision frontale. On présente un aperçu des données sur l'impulsion des pré-collisions et des collisions fournies par Toyota. On explore l'exactitude des données sur l'impulsion des collisions à partir d'une série d'essais de collisions menés avec des véhicules équipés d'EDR. Les données obtenues des EDR sont comparables aux renseignements équivalents obtenus à l'aide d'appareils de laboratoires. L'étude a mené des essais de collision frontale sur une gamme de vitesses d'essais et à l'aide d'un certain nombre de modèles différents de véhicules. An evaluation of the four injury risk curves proposed in the NHTSA NCAP for estimating the risk of AIS>= 3 injuries to the head, neck, chest and AIS>=2 injury to the Knee-Thigh-Hip (KTH) complex has been conducted. The predicted injury risk to the four body regions based on driver dummy responses in over 300 frontal NCAP tests were compared against those to drivers involved in real-world crashes of similar severity as represented in the NASS. The results of the study show that the predicted injury risks to the head and chest were slightly below those in NASS, and the predicted risk for the knee-thigh-hip complex was substantially below that observed in the NASS. 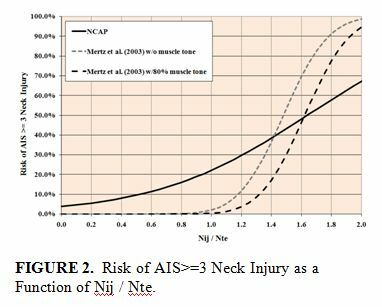 The predicted risk for the neck by the Nij curve was greater than the observed risk in NASS by an order of magnitude due to the Nij risk curve predicting a non-zero risk when Nij = 0. An alternative and published Nte risk curve produced a risk estimate consistent with the NASS estimate of neck injury. Similarly, an alternative and published chest injury risk curve produced a risk estimate that was within the bounds of the NASS estimates. No published risk curve for femur compressive load could be found that would give risk estimates consistent with the range of the NASS estimates. Additional work on developing a femur compressive load risk curve is recommended. Over the past two decades the popularity of consumer crash test programs, commonly referred to as New Car Assessment Programs (NCAP), has grown across the world. They are popular among government regulators as they afford a means of promoting safety innovations and levels of vehicle performance beyond those dictated by national standards. They also fulfill the demand for information regarding the safety ranking of vehicles among consumers contemplating the purchase of a new vehicle. There is no question that consumer crash test programs greatly influence vehicle design changes as well as accelerate the fitment of new safety features. The extent to which these changes can be expected to reduce serious and potentially fatal injuries will be influenced by how well the testing protocols and associated rating schemes correctly reflect the nature of the residual safety problem they seek to address. Drawing on data contained primarily in the US National Automotive Sampling System (NASS), the field relevance of current and proposed testing and rating protocols addressing frontal crash test protection is examined. Emphasis is placed on examining how accurately injury rates computed from the dummy responses measured in consumer crash tests correspond to actual injury rates observed in the field. Additional data from Canadian field investigations and US databases such as the National Motor Vehicle Crash Causation Survey (NMVCCS) are examined to see how well frontal airbag firing times, crush pulse durations and other determinants of injury are replicated in consumer testing protocols. This portion of the analysis draws on data obtained from Event Data Recorders (EDR) in both field collisions and staged tests of the same vehicle model. 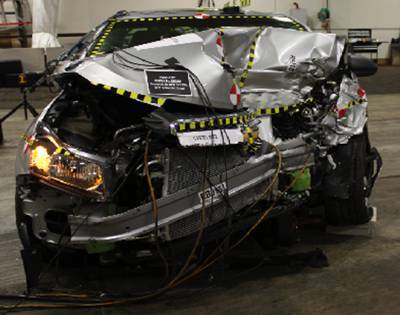 Vehicle rankings and overall frontal crash test ratings were found to be particularly sensitive to the choice of injury risk functions employed in the test. This was particularly true in the case of injury risk functions used to assess neck injury potential. Neck injury risk derived from Nij was found to show the least agreement with the field. Agreement between field chest injury rates and those derived from crash tests was improved considerably when chest injury risk functions for "older" occupants were employed. The paper concludes with a discussion of how different current testing protocols could be improved to enhance their field relevance. Many vehicles equipped with air bags also have on-board crash recording systems that, in the event of a frontal collision, capture information relating to the crash, and the deployment of safety systems such as seat belt pretensioners and air bags. Typically, event data recorders (EDR) store details of the collision itself, such as the crash pulse, seat belt pretensioner and air bag firing times, and also certain pre-crash data elements such as vehicle speed, throttle and brake application, and seat belt use status. For a number of years, collision investigators have been able to download the data stored in many General Motors and Ford vehicles through the use of a crash data retrieval tool. Such records provide an opportunity to gain a better understanding of the parameters related to real-world collisions as they afford access to objective crash data with known levels of uncertainty. The current work uses EDR information from in-depth investigations of real-world collisions in Canada. 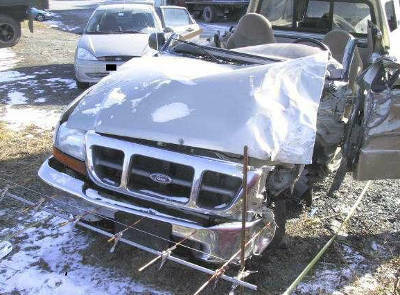 Frontal impacts are categorized by crash type and severity. The resulting subsets of crash pulses and restraint system activation times are compared to data captured as part of staged crash tests that have been undertaken for both regulatory purposes and research. This provides considerable insight into the utility of regulatory crash tests and the nature of the compliance strategies adopted by vehicle manufacturers. Beaucoup de véhicules équipés de coussins gonflables comportent également un système d'enregistrement de collisions qui, dans le cas d'une collision frontale, saisissent des renseignements sur celle-ci et sur le déclenchement des systèmes de sécurité, comme les prétendeurs de ceinture de sécurité ainsi que les coussins gonflables. Habituellement, les enregistreurs de données de conduite (EDC) enregistrent les détails de la collision, comme l'impulsion de collision, le moment du déclenchement du prétendeur de ceinture de sécurité et du coussin gonflable, en plus de certains éléments d'information précédant la collision, tels que la vitesse du véhicule, l'utilisation de l'accélérateur et l'application des freins ainsi que l'état de l'utilisation de la ceinture de sécurité. Depuis plusieurs années, les enquêteurs sur les collisions peuvent télécharger les données enregistrées dans de nombreux véhicules de General Motors et de Ford au moyen d'un outil d'extraction de données de collision. De tels enregistrements permettent de mieux comprendre les paramètres liés aux collisions réelles puisqu'on peut accéder à des données de collision objectives avec des niveaux d'incertitude connus. Actuellement, on se sert des renseignements de l'EDC obtenus à la suite d'enquêtes approfondies sur des collisions réelles qui surviennent au Canada. Les collisions frontales sont catégorisées selon le type de collision et la gravité. Les sous-ensembles d'impulsions de collision et du moment d'activation des ensembles de retenue qui en résultent sont comparés aux données saisies lors des essais de collision entrepris aux fins de réglementation et de recherche. Cette comparaison donne des éclaircissements importants quant à l'utilité des essais de collision aux fins de réglementation et à la nature des stratégies de contrôle adoptées par les fabricants de véhicules. Mertz, H.J. and Dalmotas, D.J., Effects of Shoulder Belt Limit Forces on Adult Thoracic Protection in Frontal Collisions, Paper 2007-22-0015, 51st Stapp Car Crash Conference, San Diego, California, October 29-31, 2007. Three-point restraint systems have been installed in vehicles since the early 1960s. However, it wasn't until the automatic protection rule became effective for 1987 Model Year vehicles that manufacturers began installing 3-point restraints with force-limiting shoulder belts and frontal airbags for the driver and right front passenger. This was the first time that all vehicle manufacturers had to certify that their cars would meet the 50th percentile, adult male protection requirements in the 48 km/h frontal, rigid-barrier test specified in FMVSS 208. To assess the effectiveness of these certified 3-point restraint systems, a search was done of the 1988-2005 NASS data for 3-point belted, front outboard-seated, adult occupants in passenger vehicles that were equipped with airbags and that were involved in frontal, towaway collisions. These data showed that i) half of the occupants with AIS ≥ 3 chest injuries were in collisions with a ΔV ≤ 40 km/h; ii) for older occupants (50+ years), half experienced their chest injuries at ΔVs ≤ 34 km/h; and iii) the chest injury rate for the older occupants was more than double that of the younger occupants. An analysis was done to estimate the effectiveness of various levels of shoulder belt limit loads in reducing chest injuries to older occupants. The result of the analysis indicated that a 2.5 kN shoulder belt limit load would substantially reduce shoulder belt-induced AIS ≥ 3 chest injuries in 99 percent of frontal collisions to all adult, front outboard seated occupants whose normalized bone strengths are greater than 0.4. Digges, K, and Dalmotas, D., Benefits of a Low Severity Frontal Crash Test, Proceedings of the 51st Annual Proceedings of the Association for the Advancement of Automotive Medicine, Melbourne, Australia, October 15-17, 2007. 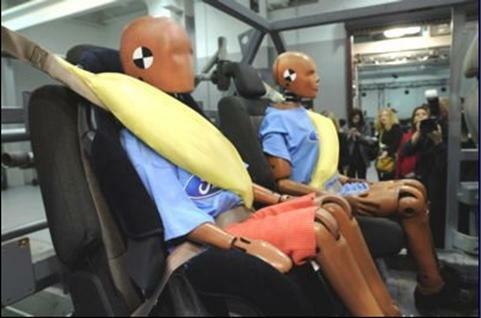 The US Federal Motor Vehicle Safety Standard for frontal protection requires vehicle crash tests into a rigid barrier with two belted dummies in the front seats. The standard was recently modified to require two separate 56 Kph frontal tests. In one test the dummies are 50% males. In the other test, the dummies are 5% females. Analysis of crash test data indicates that the 56 Kph test does not encourage technology to reduce chest injuries in lower severity crashes. Tests conducted by Transport Canada provide data from belted 5% female dummies in the front seats of vehicles that were subjected crashes into a rigid barrier at 40 Kph. An analysis of the results showed that for many vehicles, the risks of serious chest injuries were higher in the 40 Kph test than in a 56 Kph test. This paper examines the benefits that would result from a requirement for a low severity (40 Kph) frontal barrier crash test with two belted 5% female dummies and more stringent chest injury requirements. A preliminary benefits analysis for chest deflection allowable in the range of 28 mm. to 36 mm. was conducted. A standard that limits the chest deflection to 34 mm. would reduce serious chest injury by 16% to 24% for the belted population in frontal crashes. Tylko, S., Charlebois, D., Bussièrres, A. and Dalmotas, D.J., The Effect of Breast Anthropometry on the Hybrid III 5th Female Chest Response, 50th Stapp Car Crash Conference, Dearborn, Michigan, November 6-8, 2006. Two manufacturers, Denton ATD and FTSS, currently produce the Hybrid III 5th percentile female dummy. In response to concerns raised by industry that differences in the anthropometry of the molded breasts between the two manufacturers may influence chest responses, Transport Canada conducted a comparative testing program. Thorax biofidelity tests were conducted to compare force-deflection characteristics; full frontal rigid-barrier tests were conducted at 40, 48 and 56 km/h to compare chest responses, and out-of-position chest on module static airbag deployment tests were conducted to compare peak chest deflections of the Denton and FTSS dummy jackets and of a prototype jacket without breasts. Differences in force-deflection characteristics were observed during biofidelity pendulum impacts of the two dummies, with much of the differences attributed to the different chest jackets. Differences of up to 11 mm in the peak sternum deflection and of the order of 15 g for the 3-ms chest acceleration clips were noted in rigid-barrier vehicle tests. 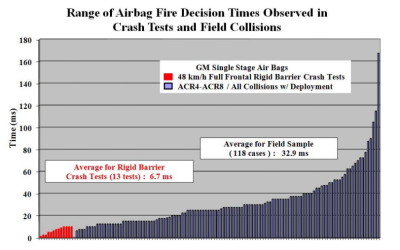 In the out-of-position airbag-deployment tests, differences in the magnitude of peak chest deflections were observed. The prototype chest jacket without breasts was found to improve repeatability in the belted crash tests and in out-of-position airbag testing. Though neither the Denton nor the FTSS chest jackets fully meet the original design intent of the Hybrid III 5th percentile dummy, the Denton dummy more closely met the drawing specifications and had less manufacturing variability. 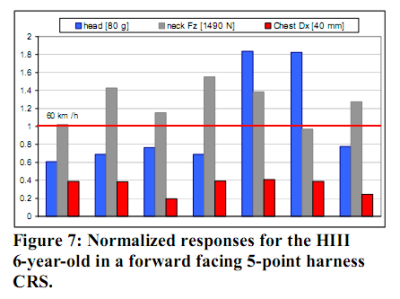 The results demonstrate the importance of detailed chest flesh assembly specifications, provide evidence that a fully molded jacket design would eliminate manufacturing variability and suggest that removal of the breasts may further improve test repeatability. Tylko, S., German, A., Dalmotas, D.J. and Bussièrres, A., Improving Side Impact Protection for the Average Man: The Development of a Harmonized Pole Test Procedure, Proceedings of the International IRCOBI Conference, Madrid, Spain, September 20-22, 2006. The paper reports on the foundational research conducted by Transport Canada in support of a harmonized pole impact test procedure. Field data from Asia-Pacific, Europe and North America were analyzed to identify the type of motor vehicle occupant at greatest risk of serious injury in narrow object crashes and to describe the pattern of injuries most frequently associated with these types of collisions. Laboratory crash testing was subsequently carried out to evaluate the responses of the ES-2re and WorldSID dummies. Oblique pole tests were conducted with five paired tests of vehicles ranging in size from small passenger cars to mid-size SUV's at impact velocities of 32 km/h. Tylko, S. and Dalmotas, D.J., WorldSID Responses in Oblique and Perpendicular Pole Tests, Paper 05-0256, 19th International Technical Conference on the Enhanced Safety of Vehicles, Washington, D.C., USA, 2005. The International Harmonized Research Activities (IHRA) Side Impact Working Group is proposing a 15-degree oblique pole test as part of a comprehensive side impact evaluation protocol. Since collision data from around the world indicate that young males are over-represented in single vehicle collisions into fixed objects (women tend to be over-represented in vehicle-to-vehicle crashes), a side impact anthropometric test device representative of a 50th percentile adult male is believed to be the most appropriate dummy size to evaluate the protective capabilities of vehicles subjected to pole impacts. 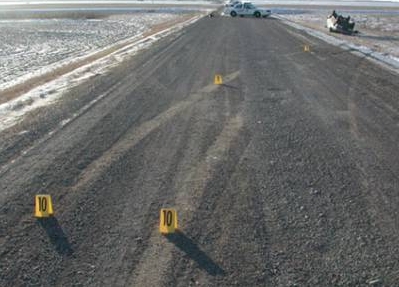 In support of the IHRA Side Impact working Group activities, Transport Canada conducted a series of paired vehicle tests to compare the responses of WorldSID in 15-degree oblique pole tests to those observed in a perpendicular pole test. Vehicles included small North American vehicles equipped with head-thorax seat mounted side airbags and mid-size and SUVs equipped with both seat mounted thorax airbags and curtain technology. While the oblique test configuration tended to result in more elevated responses a number of test parameters including side airbag deployments, dummy arm kinematics and dummy position were found to significantly affect dummy responses. WorldSID performance and thoracic measurement sensitivity in the oblique loading environment observed in the 15-degree pole test are discussed and compared to that of the ES-2re. Tylko, S. and Dalmotas, D.J., Protection of Rear Seat Occupants in Frontal Crashes, Paper 05-0258, 19th International Technical Conference on the Enhanced Safety of Vehicles, Washington, D.C., USA, 2005. Regulations and vehicle design optimization have traditionally focused on the occupants of front seats. Stringent requirements exist for the driver and front right passenger but there are no dynamic crash test requirements for rear seat occupants. The introduction of frontal airbags and the concurrent increased incidence of child fatalities in low speed frontal collisions brought urgency to the public health message advising parents to place children 12 years and under in the rear seat. Anthropometric test dummies representative of a 5th percentile adult female or 12-year-old child were used together with the recently introduced Hybrid III 10-year-old dummy and the Hybrid III 6-year-old dummies to evaluate rear seat occupant protection in full frontal rigid barrier tests and frontal offset deformable barrier tests. The 6-year-old dummy was restrained with a belt-positioning booster while the 10-year-old was restrained with either a belt positioning booster or the vehicle 3-point seatbelt. Dummy responses were examined as a function of seat position and in the case of child dummies, booster seat type. Successful restraint of the chest was associated with high belt loads and pronounced chest deflections while slippage of the belt from the shoulder led to extreme flexion of the torso, head strikes and elevated neck loads. Booster seats had no effect on shoulder belt translation during the dynamic event but were observed to maintain the abdominal portion of the belt in place, over the pelvis. Opportunities for rear seat occupant protection and child dummy enhancements are discussed. Augenstein, J., Digges, K., Bahouth, G., Dalmotas, D., Perdeck, E. and Stratton, J., Investigation of the Performance of Safety Systems for Protection of the Elderly, Proceedings of the 49th Annual Proceedings of the Association for the Advancement of Automotive Medicine, 49: 347-356, ISSN: 1540-0360, Boston, Massachusetts, September 12-14, 2005. This study investigates injury occurrence for belted occupants as a function of age. 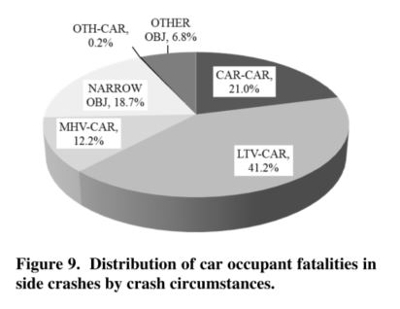 An analysis of NASS/CDS 1997-2003 data was conducted to determine crash involvement rates and injury rates for front seat occupants versus mean occupant age. In frontal and near-side crashes, the average age of MAIS 3+ belted front seat occupants injured in crashes less severe than 15 mph is of the order of 50 years. The average age of the population exposed to crashes less severe than 15 mph is under 40 years old. The crash exposure and frequency if injuries to the elderly were both found to be the highest in low severity crashes. The chest is the most frequent body region injured for the elderly. These findings suggest the need for more benign safety systems to protect the elderly in low severity crashes. Design of safety systems for the elderly should give priority to reducing the chest loading in low severity frontal and near-side crashes. 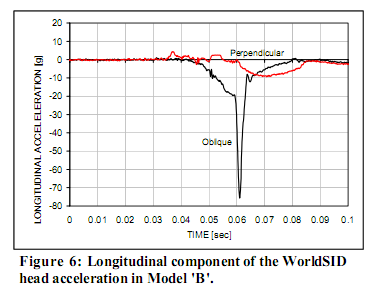 Tylko, S. and Dalmotas, D., SID-IIs Response in Side Impact Testing, 2004 SAE World Congress and Exhibition, SAE Paper No. 2004-01-0350: Rollover, Side, and Rear Impact (SP-1880), Society of Automotive Engineers, Warrendale, PA, USA, 2004. Arbelaez, R.A., Dakin, G.J., Nolan, J.M., Dalmotas, D.J. and Tylko, S., IIHS Side Impact Barrier - Development and Crash Test Experience, IMechE Conference Transactions: International Conference on Vehicle Safety 2002, 73-88, London, UK, 2002. Twisk, D., Rouhana, S., Elhagediab, A., Berliner, J., Baayoun, E., Dalmotas, D. and Tylko, S., Laboratory Experience with the IR-TRACC Chest Deflection Transducer, SAE Paper 2002-01-0188, 2002 SAE World Congress, Detroit, Michigan, USA, March 4 - 7, 2002. Byrnes, K., Abramczyk, J., Berliner, J., Irwin, A., Jensen, J., Kowsika, M., Mertz, H.J., Rouhana, S.W., Scherer, R., Shi, Y., Sutterfield, A.,Xu, L., Tylko, S., and Dalmotas, D.J., ES-2 Dummy Biomechanical Responses, Paper 2002-22-0018, 46th Stapp Car Crash Conference, Ponte Verdra Beach, Florida, USA, 2002. Terrel, M., Newland, C., Seyer, K. and Dalmotas, D.J., The Dependence of Side Impact Injury Risk on MDB Configuration, Paper Number 399, 17th International Technical Conference on the Enhanced Safety of Vehicles, Amsterdam, June 4-7, 2001. Tylko, S. and Dalmotas, D.J., Side Airbags:Evaluating the Benefits and Risks for Restrained Children, Paper Number 420, 17th International Technical Conference on the Enhanced Safety of Vehicles, Amsterdam, June 4-7, 2001. Tylko, S. and Dalmotas, D.J., Static Out-of-Position Test Methodologies: Identifying a Realistic Worst Case for Small Stature Female Drivers, Paper Number 421, 17th International Technical Conference on the Enhanced Safety of Vehicles, Amsterdam, June 4-7, 2001. Dalmotas, D.J., German, A. and Tylko, S., The Crash and Field Performance of Side-Mounted Airbag Systems, Paper Number 442, 17th International Technical Conference on the Enhanced Safety of Vehicles, Amsterdam, June 4-7, 2001. Digges, K. and Dalmotas, D.J., Injuries To Restrained Occupants In Far-Side Crashes, Paper Number 351, 17th International Technical Conference on the Enhanced Safety of Vehicles, Amsterdam, June 4-7, 2001. Transport Canada, Evaluation of the Effectiveness of Air Bags and Seat Belts, Fact Sheet RS 2001-03 E, Road Safety and Motor Vehicle Regulation, October, 2001. Tylko, S. and Dalmotas, D.J., Dangerous Sides, Recovery Magazine, 2001;12 (51), Insurance Corporation of British Columbia, 2001. Tylko, S. and Dalmotas, D.J., Assessment of Injury Risk to Children from Side Airbags, SAE Paper 2000-01-SC02, 44th Stapp Car Crash Conference, Atlanta, Georgia, USA, 2000. Seyer, K., Newland, C., Terrell, M. and Dalmotas, D.J., The Effect of Mass, Stiffness and Geometry on Injury Outcome in Side Impacts - A Parametric Study, SAE Paper 2000-01-SC01, 44th Stapp Car Crash Conference, Atlanta, Georgia, USA, 2000. Dalmotas, D.J., German, A. and Hurley, R., Second Generation Airbag Systems: A Preliminary Evaluation of Field Accident Performance, CMRSC-XI, Halifax, Nova Scotia, 1999. Beusenberg, M., Kot, M., Dalmotas, D.J.and Malo, R., Modifications to EuroSID-1 to Improve Thoracic Responses, JSAE Spring Convention, Yokahama, Japan, May 19-21, 1999. Dalmotas, D.J., Assessments of Air Bag Performance Based on the 5th Percentile Female Hybrid III Crash Test Dummy, Paper No. 98-S5-O-07, 16th International Technical Conference on the Enhanced Safety of Vehicles, Windsor, Ontario, Canada, 1998. Morris, A., Fildes, B., Digges, K., Dalmotas, D.J. and Langweilder, K., Injuries in Primary and Supplemental Airbag Systems, Paper No. 98-S5-O-03, 16th International Technical Conference on the Enhanced Safety of Vehicles, Windsor, Ontario, Canada, 1998. German, A., Dalmotas, D.J. and Hurley, R., Air Bag Collision Performance in a Restrained Occupant Population, Paper No. 98-S5-O-04, 16th International Technical Conference on the Enhanced Safety of Vehicles, Windsor, Ontario, 1998. German, A., Dalmotas D.J., Comeau, J-L., Monk, B., Contant, P., Gou, M., Carignan, S., Lussier, L-P., Newman, J. and Withnall, C., In-Depth Investigation and Reconstruction of an Air-Bag Induced Child Fatality, Paper No. 98-S5-W-19, 16th International Technical Conference on the Enhanced Safety of Vehicles, Windsor, Ontario, Canada, 1998. Rangarajan, N., White, R., Shams, T., Beach, D., Fullerton, J., Haffner, M., Eppinger, R., Rhule, D., Pritz, H., Dalmotas, D. and Fournier, E., Design Criteria, Design, and Performance of the THOR Advanced Frontal Crash Test Dummy Thorax and Abdomen Assemblies, Paper No. 98-S9-O-12, 16th International Technical Conference on the Enhanced Safety of Vehicles, Windsor, Ontario, Canada, 1998. Stewart, D.E., Arora, H.R., and Dalmotas, D.J., An Evaluation of the Effectiveness of Supplementary Restraint Systems ("Air Bags") and Conventional SeatÂ�Belts: Estimates of the Numbers of Lives Saved Among Front Seat Outboard Occupants of Light-Duty Vehicles Involved in Collisions Attributable to the Use of Seat Belts and the Fitment of Supplementary Restraint Systems ("Air Bags") in Canada, 1990-1997. Transport Canada Publication No.Â�TP13187Â�E, Ottawa, Ontario, Canada, 1998. Stewart, D.E., Arora, H.R. and Dalmotas, D.J., Estimation Methodologies for Assessing Effectiveness of Seat Belt Restraint Systems and the National Occupant Restraint Program, Publication TP13110 E/F, Transport Canada, Road Safety, Ottawa, Canada, 1997. Dalmotas, D. J.,Hurleyy, R. M and German, A., Supplemental Restraint Systems: Friend or Foe to Belted Occupants, 40th Annual Proceedings of the Association for the Advancement of Automotive Medicine, Vancouver, BC., October 7-9, 1996. Dalmotas, D.J., Gibson, T and Withnall, C, Side Impact Protection Opportunities, Paper 96-S6-O-04, 15th International Technical Conference on the Enhanced Safety of Vehicles, Melbourne, Australia, May, 1996. Dalmotas, D.J., Hurley, J., German, A.and Digges, K., Air Bag Deployment Crashes in Canada, 15th International Technical Conference on the Enhanced Safety of Vehicles, Melbourne, Australia, May,1996. German, A., Dalmotas, D. J., McClafferty, K. J. and Nowak, E. S., Real-World Collision Experience for Airbag Technology, Canadian Society for Mechanical Engineering Forum on the Theory of Machines and Mechanisms and Advances in Transportation Systems, May 7-9, 1996, Hamilton, Ontario. Dalmotas, D.J., German, A. and Welbourne, E.R., Directed Studies: A Focused Approach to Collision Investigation, Canadian Police Research Centre, Ottawa, Ontario (HV 8079.55 D245) 1996. Dalmotas, D.J., Hurley, R.M. and German, A. Air Bag Deployments Involving Restrained Occupants, SAE Paper 950868, 1995 SAE International Congress and Exposition, Detroit, Michigan, USA, 1995. Dalmotas, D.J., German, A., Hendrick, B. and Hurley, R., Airbag Deployments: The Canadian Experience, The Journal of Trauma: Injury, Infection and Critical Care, Vol. 38, No. 4; 1995. Pedder, J., Dalmotas, D, Gibson, T., and Gilbert, D., The Development of a Protocol for Documenting Vehicular Sitting Posture of Car Occupants Involved in Rear-End Collisions, 22nd Annual Workshop on Human Subjects for Biomechanical Research. Fort Lauderdale, Florida, October, 1994. Dalmotas, D., Newman, J. and Gibson, T, Prospects for the Further Improvement of Side Impact Protection Based on Crash Testing. Paper 94-S6-O-04, 14th International Technical Conference on Enhanced Safety of Vehicles, Munich, 1994. Newman, J.A., Dalmotas, D.J., Atlanto-Occipital Fracture Dislocation in Lap-Belt Restrained Children,. SAE Paper 933099, Child Occupant Protection Symposium, San Antonio, Texas, USA, 1993. Weber, K., Dalmotas, D. and Hendrick, B., Investigation of Dummy Response and Restraint Configuration Factors Associated with Upper Spinal Cord Injury in a Forward-Facing Child Restraint, SAE Paper 933101, Child Occupant Protection Symposium, San Antonio, Texas, USA, 1993. 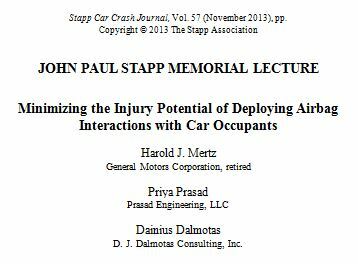 Dalmotas, D., German, A., Gorski, Z.M., Green, R.N., and Nowak, E.S., Prospects for Improving Side Impact Protection Based on Canadian Field Accident Data and Crash Testing, SAE Paper 910321, 1991 SAE International Congress and Exposition, Detroit, Michigan, USA, 1991. Green, R.N., German, A., Nowak, E.S., Dalmotas, D.J. and Stewart, D.E., Fatal Injuries to Restrained Passenger Car Occupants: Crash Modes and Kinematics of Injury, 35th Annual Proceedings of the Association for the Advancement of Automotive Medicine, October, 1991. Dalmotas, D.J. and Krzyzewski, J., Restraint System Effectiveness as a Function of Seating Position, SAE Paper 870489, 1987 SAE International Congress and Exposition, Detroit, Michigan, USA, 1987. Lawson, J. and Dalmotas, D.J., An Assessment of the Potential Cost - Effectiveness of a Regulation Requiring Three-Point Rear Seat Belts in Passenger Cars, Transport Canada, 1985. Dalmotas, D.J., Injury Mechanisms to Occupants Restrained by Three-Point Seat Belts in Side Impacts, SAE Paper 830462, 1983 SAE International Congress and Exposition, Detroit, Michigan, USA, 1983. Dalmotas, D.J., Mechanisms of Injury to Vehicle Occupants Restrained by Three-Point Seat Belt, SAE Paper 801311, 24th STAPP Car Crash Conference, Troy, Michigan, October 15-17, 1980.